Even though this card will be entered in 3 challenges I made it especially for the special card drive going on at Stamp Something to send cards of encouragement and love to a little girl named Jaimie. It's such a shame that innocent people have to be subjected to such mean, evilness in the world. 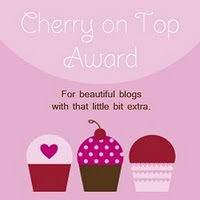 I would encourage you to go over to Stamp Something and read Jaimie's story. I won't try to repeat it here so that I won't get any of the details wrong. I hope that every one who reads her story will pray for her and her family and we also need to pray for the mean, evil people in this world also, that someone, somewhere would be able to touch their minds and hearts and open their eyes so they might change for the better of themselves and other people they touch. 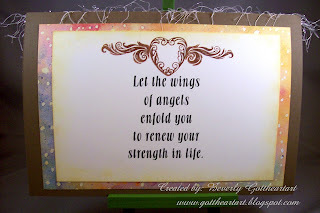 A quick note--the saying on the inside is something I think I came up with, but just in case, I read it somewhere and can't remember the author, credit would be given to them, I generated it in Printmaster 11 then stamped the heart and wings and sponged around the edges. 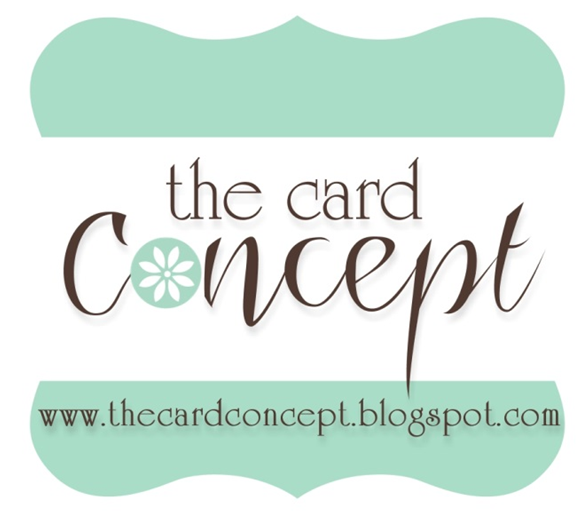 Supplies: Card Blank 10 1/2" X 7 1/2" folded in half with Stampin Up Softe Suede card stock, Papers: Stampin Up: Bermuda Bay, Very Vanilla, Best Occasions Pearlescent Paper Pack, Provo Craft: Illuminations, Stamps: Hot Off The Press: Flights of Fancy, Inkadinkado:99506 O Holy Night, Inks: Ranger Archival Ink: Sepia, jet black, Brilliance: Galaxy Gold, PrismaColor pencils, Gamsol, blending stump, Sakura Gelly Roll Pen: Clear Star, Cuttlebug embossing folder: D'Vine Swirls, Jesse James Beads: Scrolled Hearts, pearl sticker dots, eyelash yarn: Michael's, pop dots. Oh, you are right; this is beautiful as is the sentiment. I would gush more over the card, but am busy processing the reason you made it. Thank you for being a caring, loving human being who shares her talent so readily to make others feel better. Beverly! I almost missed your card...I was looking in Mr. Linky and then saw your link in the comments section! SOO glad I found you...your card is beautiful. I love how you used the colors. Such a tragic story behind the making of the card. So very nice of you to join in on trying to bring some comfort to the family...at least to know that others are thinking of them and praying for them. Thanks for joining us on the Color Dare..hope to see you back again this week! Great job on the Color Dare! I love it!! Thanks for playing along!!! 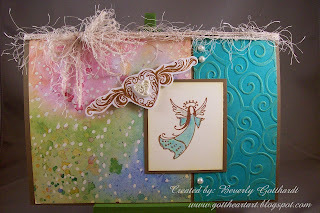 Such a pretty card, love the handmade backing paper! Thanks so much for joining us and sending a card to Jamie with Stamp Something this week.